As cities struggle to do more with less and people everywhere cry out for places of meaning and beauty, we have to find fast, creative, profitable ways to capitalize on local ingenuity and turn public spaces into treasured community places. 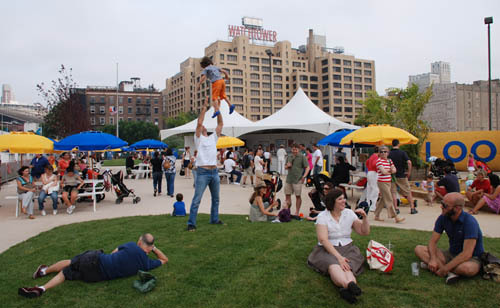 ‍Pier 1 at Brooklyn Bridge Park was a temporary park that activated the space with low-cost revenue-producing uses before today’s more expensive design could be implemented. Interestingly, many of the best, most authentic and enduring destinations in a city, the places that keep locals and tourists coming back again and again and that anchor quality, local jobs, were born out of a series of incremental, locally-based improvements. One by one, these interventions built places that were more than the sum of their parts. The time is right to rethink the way that we do development, using an approach called “Lighter, Quicker, Cheaper” (LQC). This approach is based on taking incremental steps, using low-cost experiments, and tapping into local talents (e.g. citizens, entrepreneurs, developers, and city staff). These smaller-scale projects are being implemented in a variety of environments, including on streets, squares, waterfronts, and even parking lots. Transform underused spaces into exciting laboratories that citizens can start using right away and see evidence that change can happen. Rrepresent an “action planning process” that builds a shared understanding of a place that goes far beyond the short term changes that are made. Leverage local partnerships that have greater involvement by a community and results in more authentic places. Encourage an iterative approach and an opportunity to experiment, assess, and evolve a community’s vision before launching into major construction and a long term process. Employ a place-by-place strategy that, over time, can transform an entire city. With community buy-in, the LQC approach can be implemented across multiple scales to transform under-performing spaces throughout an entire city. We’re in the midst of an unprecedented moment in planning. Although signs of hardship are all around, we see the emergence of a powerful, networked, creative movement of people who demonstrate that incremental, place-based change is possible despite economic or political obstacles. There is also a growing awareness that cities succeed or fail at the scale of place. Leaders know they have to be able to react more quickly to a city’s diverse population and changing conditions than ever before. And that requires resiliency: adaptability, agility, the means to repair damage and remake derelict spaces of every scale. This can’t come from the top down- it has to emerge incrementally, and it has to be driven by the people who know what they need. LQC offers the potential to create profound positive change in the future of cities around the world. By changing the way we think about development to include small scale, incremental changes, an immediate impact can be made on local economies, transportation, architecture and in how destinations are created. Markets have always been the foundation of strong local economies and are one of the best examples of an LQC approach. The phrase “Lighter, Quicker, Cheaper” (LQC) was coined and used by Eric Reynolds, Founding Director of Urban Space Management (USM) over 40 years ago in his work revitalizing urban spaces that he refers to as “in transition.” A London and New York based organization, USM’s projects, like Gabriel’s Wharf in London, shows how a multi-use public destination can emerge out of a series of small-scale, inexpensive improvements that occur incrementally and encourage entrepreneurial activity and bring out the best of a community’s creativity. 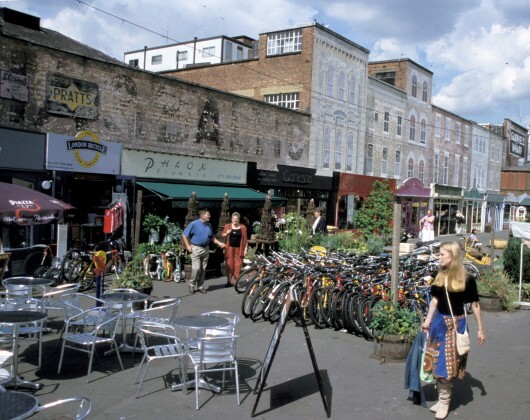 ‍Gabriel’s Wharf, London, UK after an Urban Space Management intervention. By partnering with a local set design company to create colorful facades for the concrete garages already present on the site, this LQC face lift created a thriving destination for shopping, dining and gathering in a former parking lot. Gabriel’s Wharf was just another parking lot until USM embarked on a development strategy that centered on using existing buildings (in this case, concrete garages), employing a set design company to create colorful facades on the garages and then working with local artisans and craftsmen to transform them into studios where they could display and sell their work. Most of what you can buy at this market is made by the person who sells it to you. USM uses the concept of a “Coral Reef” to explain the Lighter, Quicker, Cheaper development practices that guide all their projects, including Gabriel’s Wharf. Building a complex, sustainable “coral reef” ecosystem all starts with dropping down a few old tires and cinder blocks. In other words, instead of spending a lot of money on infrastructure, USM concentrates on keeping rents low by finding creative, low-cost ways to set up basic structures to meet the tenants’ needs and get them producing income right away. Because the main infrastructure at Gabriel’s Wharf was built by a set design company, everything was in place within three months. Like a coral reef, the color and vibrancy of lighter, quicker, cheaper developments comes from the tenants who occupy the space- from the "tropical fish" that are drawn to the tires because of food or other fish. Like a deep sea ecosystem, the diversity of activities and users grows and grows over time. Fish attract fish and people attract people: as more and more vendors set up in the same area, the destination becomes even more vibrant. The right mix of “old tires” attracts local restaurateurs and retailers and creates a comfortable, welcoming, human-scaled space. A critical mass of vendors attract crowds which attract other vendors. By getting away from a focus on high design, USM can activate the site immediately, laying the foundation for the many valuable and interconnected interactions and exchanges that make up a healthy reef and a great multi-use destination. “Lighter, Quicker, Cheaper” is a particularly effective way to make improvements to streets because it bridges the gap between the need to solve a problem quickly and the long time-frame and bureaucratic processes that exists in most municipalities. New York City might be the last place you would expect to be paired with the phrase "lighter, quicker, cheaper," yet we want to highlight some ways in which the Big Apple is justifying those words. In 2005, the Streets Renaissance Campaign was founded (by PPS and Transportation Alternatives) to help bring about changes to New York City's streets and sidewalks and achieve a better balance between motor vehicles, pedestrians, bicycles, and transit. ‍Times Square is no longer just a place to drive through: low-cost interventions re-directed traffic and created a space for pedestrians to meet and sit and watch the world go by. One of the first changes was at Times Square which was suffering from a severe lack of pedestrian space. Under the sponsorship of the Times Square Alliance, PPS conducted an evaluation of existing pedestrian and vehicle movement patterns, surveyed pedestrians, researched relevant benchmarks from around the world and recommended short term changes that would improve Times Square as a "public space." 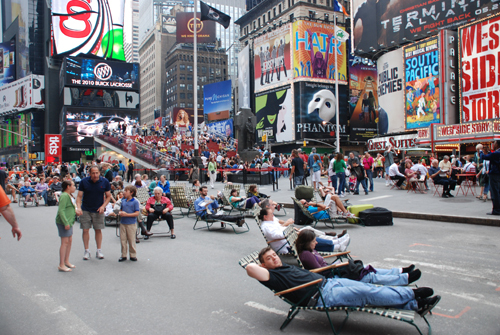 A temporary experiment was conducted by DOT in partnership with the Times Square Alliance which included closing some of the vehicle lanes on Broadway to traffic and converting the space to pedestrian use -- with places for people to sit, wait, and meet each other. The New York City DOT has expanded the concept as part of its Broadway Boulevard program, and extended the changes from 31st Street north to Columbus Circle at 59th Street. DOT used paint, barriers and furniture to slow traffic and change the way users experience the street: vehicle lanes were removed, streets were closed, and more inviting areas for pedestrians and cyclists were developed with movable chairs, tables, umbrellas and other amenities. The improvements in safety and traffic flow were so successful that Mayor Bloomberg has decided to make these changes permanent. NYCDOT will soon begin a capital project to design and build the plazas and corridor treatments that use higher quality materials designed to be permanent. In addition to the enhanced pedestrian experience along Broadway, the DOT reports significant gains in pedestrian safety and vehicle efficiency as a result of these low-cost interventions. Injuries to motorists and passengers in the project area are down 63%. Travel time for vehicles in the area has decreased and the interventions have been met with public approval: 74% of New Yorkers surveyed by the Times Square Alliance agree that Times Square has improved dramatically over the last year. But it has also produced a larger shift in the way users perceive New York's streets. As the President of the Times Square Alliance said, "[the pedestrian plazas have] shifted the paradigm for what a street and sidewalk experience is supposed to be like in New York City." Granville Island in Vancouver, British Columbia, epitomizes how an LQC approach was used over the past 35 years to produce incremental changes and to create, what is today, the most visited destination in British Columbia and second only to Niagara Falls in all of Canada. Granville Island got its start in the seventies when the Canada Mortgage and Housing Corporation (CMHC) decided to develop a 35 acre island across from downtown Vancouver. Granville Island was home to a variety of marine related uses, a concrete plant, and many dilapidated corrugated metal sheds. CMHC even described the island in 1975 as “a semi-industrial slum.” The vision was to create a place here that would provide social and recreational services for the Vancouver community, highlight its arts and cultural resources, and bring in other related services and uses that together would make it economically self sustainable. ‍To preserve the character of the Island, many relics of Granville’s industrial past were re-painted, like these corrugated buildings. Awnings and painted pipes were added to unify the Island and create an environment that was bright and fun. The Canadian Federal Government provided a $25M grant to facilitate CMHC’s work in redeveloping the Island with no guarantee that any more funds would be available. Even at that time, this was not a lot of money given the large scale of the development and CMHC had to be creative. Instead of using the money to redevelop the Island all at once, the team that re-imagined Granville Island decided instead to use an “incremental redevelopment” strategy. A traditional approach might have been to buy out the leases of the remaining industrial tenants- but that would have consumed most of the grant money, leaving little to re-invent the Island as a great destination over the following years. The redevelopment team instead used an incremental approach that allowed the existing tenants to stay through the duration of their leases, and used the grant money to make small-scale, improvements on the Island. This approach allowed the character of the Island to grow over time so that it could continually evolve to accommodate the demands of the city around it. Dilapidated buildings were stabilized, painted, and linked together with colorful pipes, awnings, and signage. Some buildings were added to create a feeling of an industrial area that had come back to life with many things for people to do. Today, Granville Islandcontinues to grow as a multi-use destination for both tourists and locals. The marine related uses have been preserved, and a variety of arts, culture and community related uses exist along side, the concrete plant -- a good, if unlikely partner in the development. 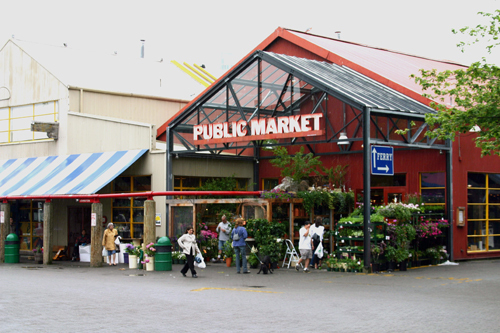 Granville Island is also home to a vibrant public market and a wide range of uses that have helped ensure the island’s economic viability. It is entirely self-sustaining and has required no additional financial support from the Canadian government. A lighter, quicker, cheaper approach is a powerful way to draw on the creativity of designers because it encourages an emphasis on people, comfort, and activities, and not on design for the sake of design. The approach has been used by designers in places as established as Rockefeller Center in New York City and as upcoming as Newcastle, Australia. Thirty years ago, Rockefeller Center was a prestigious but passive corporate address: the retail spaces along the Channel Gardens and those facing Fifth Avenue, housed banks and travel agencies - hardly the kind of attractions that would create a major public destination. ‍The Planters in the Channel Gardens of Rockefeller Center are used for seasonal displays and created an active destination for tourists and locals and cultivated new partnerships. PPS’ involvement started in 1975 with a pilot project in the Atlas Court to demonstrate how simple improvements– a circular bench and plantings – could dramatically change the use and enjoyment of a public space. One of PPS’ next recommendations, which was to add seating to the Channel Gardens, was the linchpin for a series of lighter, quicker, cheaper projects that transformed it into, what is now, a lively, social space. 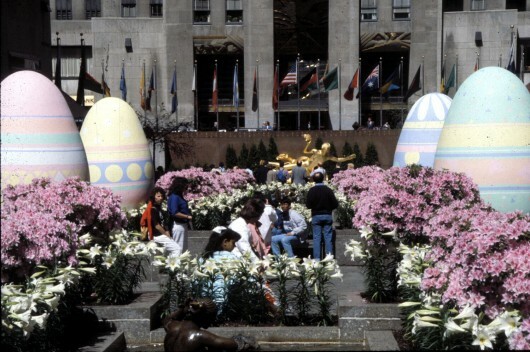 The experience that visitors to Rockefeller Center have changes throughout the year. The planters are used for seasonal horticultural displays and attractions like the Christmas tree, ice skating rink and numerous other displays. PPS’ initial work, which emphasized the power of small, thoughtful alterations that would make the space more comfortable, provided the foundation for a highly effective and seasonal program of events and exhibits. Chances are you haven’t heard of Newcastle, Australia, but if you want to learn ways to enliven your downtown, then you need to know about the lighter, quicker, cheaper interventions that helped catapult a former steel town into one of Lonely Planet’s Top 10 Cities for 2011. LQC interventions are a creative way to turn underused storefronts into opportunities to showcase local creativity and boost the local economy. For many years, Newcastle was just another rusting steel town. After decades of disinvestment, the downtown was riddled with vacancies. Storefronts stood empty, there was no life on the street and people had few reasons to go there. There were many legal and financial structures that provided little incentives for landlords to rent an empty retail space, making it hard for local entrepreneurs to get started. One Newcastle resident, Marcus Westbury, sought to change all of that. He began a non-profit called "Renew Newcastle," which is responsible for catalyzing the transformation of his city's downtown." Westbury would be the first to tell you he has no formal planning experience. A self-described troublemaker, producer, geek, and writer, he learned by doing and what he did was light, quick and cheap. He was a festival director and a TV producer, and uses terms like “staging,” and “working behind the scenes” to describe how spaces “behaved,” and what it would take to change that condition, in order to make it easier for creative people, who he calls “initiativists,” to take a risk in a project. 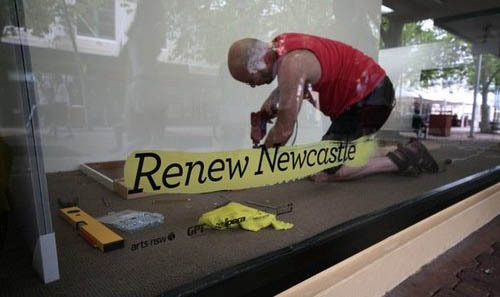 To get Renew Newcastle off the ground, Westbury financed everything with his personal credit card. By avoiding costly alterations to a building’s structure, Westbury’s scheme was able to cheaply and effectively incubate and kick start many local artists and businesses. Many great plans get bogged down because they are too big, too expensive, and simply take too long to happen. Meanwhile the high cost of missed opportunities for economic development- and public life- continue to add up. LQC projects provide a powerful means to translate a community’s unique vision into physical reality. Whether they are spear-headed by local government, developers or community activists, LQC interventions both nurture and are powered by a community’s social capital and ingenuity: the “action planning” process behind LQC can help to build a new, shared understanding of place that transcends the duration of a particular intervention to engage unlikely partners for the ongoing betterment of their community.